Jack Pritchard's Isokon company was one of the few British examples of a firm truly devoted to Modernism. In addition to building London's Lawn Road Flats, in Hampstead, Pritchard employed a succession of continental Modernists to work for his furniture company. These included the Germans Walter Gropius and Arthur Korn, and the Hungarian Marcel Breuer, as well as the Viennese emigré Egon Riss. Riss (who lived briefly in Lawn Road Flats, as had Gropius and Breuer) designed one of Isokon's most intriguing products. The Penguin Donkey was created specifically to carry the new type of paperback book, which for the first time made available reasonably priced, best-quality, international literature to a wide public for the price of a pack of cigarettes (which were themselves relatively cheaper than today). The books were stacked in the side elements (appropriately referred to as panniers) and newspapers and magazines were slotted into the centre. The organic, curvilinear shape of the Donkey, raised on legs rounded in elevation, was made possible by the use of very thin plywood. Isokon's production was always very small, but it appears that only a few of the Donkeys were made before war began. Pritchard had agreement from Penguin's publisher Allen Lane to insert leaflets advertising the Donkey into every Penguin book. 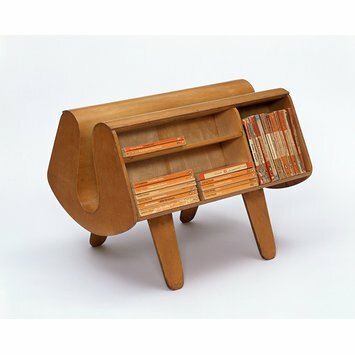 Had war not broken out, it is possible that the Donkey would have been Isokon's first commercially successful product. Despite its very limited production, the Donkey had an afterlife. While many modernist designs have been manufactured after the 1960s (some for the first time in quantity), the Penguin Donkey has been reinvented several times. In 1963 Pritchard sold a new version ('Mark 2'), revised by the well-known designer Ernest Race In 2003 Isokon's successor firm, Isokon Plus, began making the Donkey 3, designed by Shin and Tomoko Azumi. Free-standing U-shaped bookshelf, the overall shape formed from a single sheet of bent plywood creating a central well for storing magazines, the sides fitted with plywood shelves for Penguin paperback books, on four plywood feet. The shape is reminiscent of paniers or saddlebags, giving rise to the object name. The Studio, vol.119 no.565 pp.138-9. The 'Penguin Donkey' was designed specifically to carry the new Penguin paperbacks. Books were stacked in the side elements (or 'panniers') and newspapers and magazines slotted into the centre. To advertise it, a leaflet was included in every Penguin book. Had war not broken out the 'Donkey' might well have been Isokon's first commercially successful product. Pritchard's Isokon firm employed several European emigré designers, among them Egon Riss, to design plywood furniture. 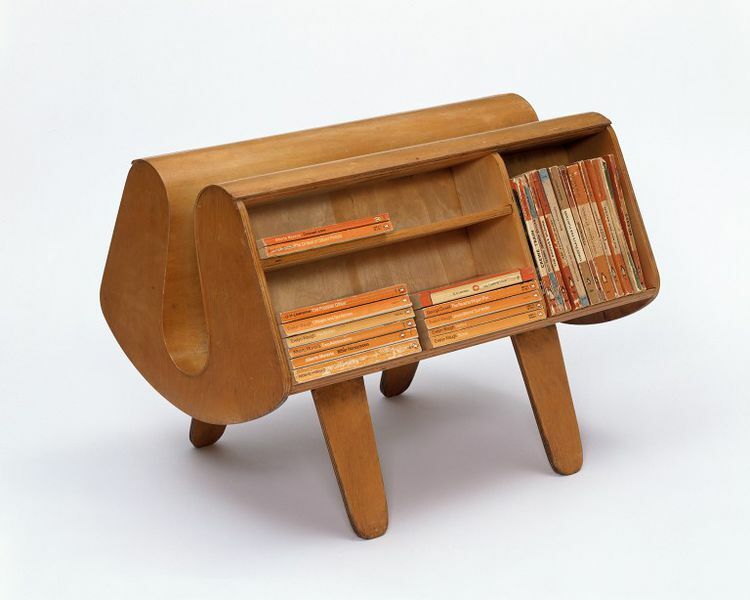 The small bookcase was marketed with advertisements slipped into Penguin paper-backs and became known as the Penguin Donkey as it resembled the paniers of a saddle bag. This example was bought by mail order in 1940 for £2 2s.